You’ve saved up for your ski vacation and are excited to go. But, you should be ready because an accident on the slopes could ruin it in a snap. You can avoid being hauled off the hill in a ski patrol toboggan or helicopter by adhering to a few safety precautions. 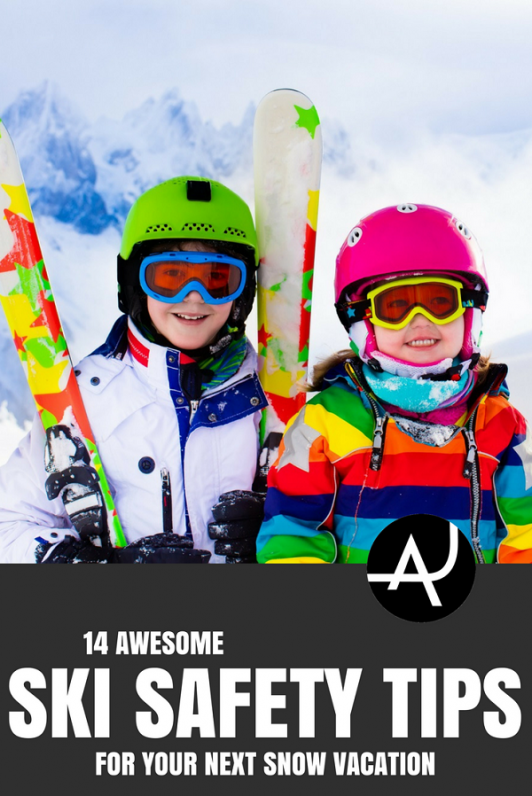 Here at The Adventure Junkies, we’ll give you 14 ski safety tips to enjoy your next vacation on the slopes. Any ski trip has an element of risk. After all, gliding downhill at high rates of speed is definitely flirting with danger. But if you prepare to have a safe trip and make safe decisions on the slopes, you should come home exhilarated from your vacation rather than injured and miserable. Get in shape for your ski vacation. That way, you’ll enjoy it more. Being in shape for skiing allows you to ski longer instead of cutting slope time short to go soak sore muscles in the hot tub. You can also string together multiple days on the slopes without needing to take a day off to recover. The best way to get in shape is to do a combination of aerobic and strengthening exercises. 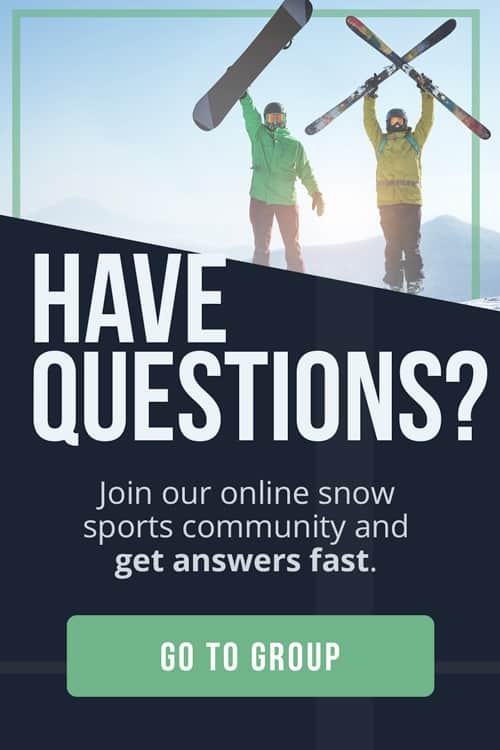 Check with your local gym to see if a ski conditioning class is offered. Ski conditioning classes usually target specific exercises to make the transition to the slope more successful. 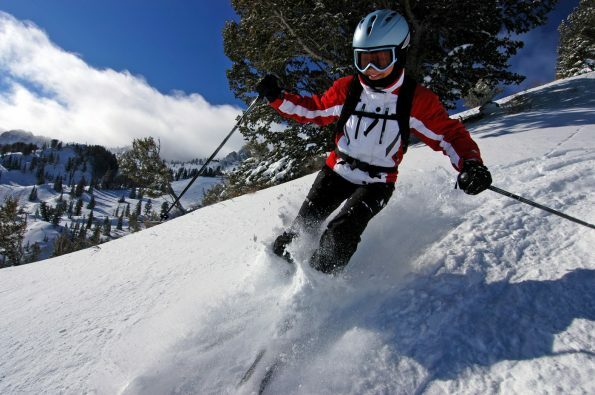 Head trauma is one of the worst injuries that a skier or snowboarder can incur. Head injuries usually occur from falls, when the head or neck slams into the snow, a person or an object like a tree. Helmets can reduce the severity of an injury to the head. 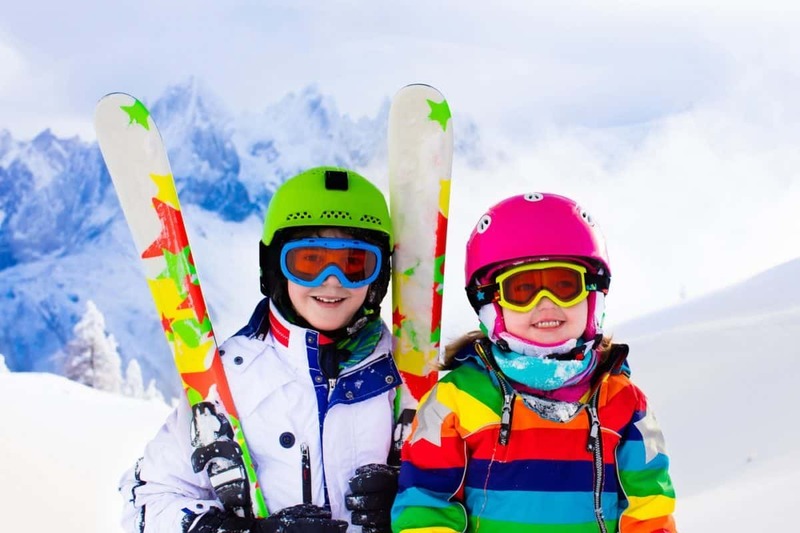 According to the National Ski Areas Association, studies have shown that helmets can reduce head injuries by 30 to 50 percent. Helmets can also convert what might be a major head injury with severe repercussions to a minor headache. The Snell Memorial Foundation, Inc. tests helmets for safety. Although there are many different safety standards for helmets, Snell-certified helmets meet the highest standards in the world. When shopping for ski or snowboard helmets meeting the highest safety standards, look for the Snell certification on the packaging. You don’t need to travel with a helmet or even purchase your own. Many ski resorts rent helmets. Check ahead to be sure rental helmets are available. The sun and snow can make you feel like you’re in a frying pan. Not only are skiers exposed to UV radiation, but the sun’s rays gain intensity by reflecting off snow surfaces. Before leaving home, you’ll need to stock up on sunscreen. Lack of skin protection can contribute to faster skin aging and cancers. For maximum protection, cover your entire body with clothing or sunscreen. The sunscreen should be at least SPF 30. 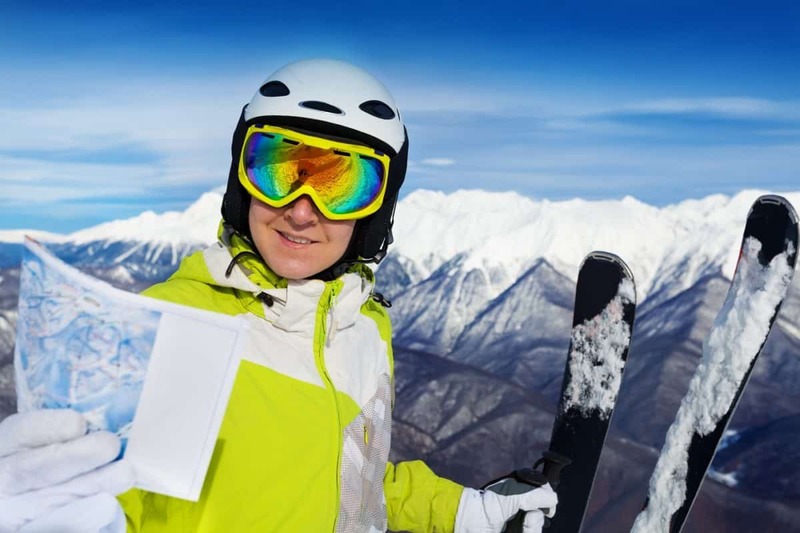 In addition, the National Ski Areas Association in the U.S. recommends sunscreens which are broad spectrum and contain zinc oxide or titanium dioxide. You’ll need to reapply sunscreen every couple hours on the slopes. To be able to do that, buy a small refillable bottle to keep in the pocket of your ski jacket. You’ll also want sunscreen lip protection handy. Lack of eye protection can let sun radiation damage the eyes. Severe cases result in snow blindness. Before leaving home, check your goggles and sunglasses for UV protection. They should be rated at 100 percent UV. Before visiting a new ski area on vacation, study the trail map. Analyze it. Make a mental note of chairlifts or runs to avoid those that may be beyond your skill level. Also, make a plan of attack for where to start your explorations. It’s always safer to start on easier slopes and work up to more difficult terrain. Remember, trail symbols are ski area specific. Although trail symbols are common across all resorts in North America, they vary at each resort. For example, green circles denoting easier runs may be steeper in the Rocky Mountains than at ski areas in the Midwest. In fact, at some more challenging resorts, green runs may be comparable to the more difficult blue squares at smaller resorts. Launching on easier runs will help you gauge the caliber of the mountain. A surefire way to wreck your vacation is to ski out of control or go on runs far above your ability. We all love challenges. But on ski slopes, be sure you have the prerequisite skills to tackle the next level before diving down the slope. Skiing under control can still be fun. It also offers the guarantee of lesser chances of muscle, ligament and bone injuries. Knowing when to quit skiing is equally important. Be in tune with your body and energy level. Be sensitive to exhaustion that can lead to injury as well. Call it a day before fatigue sets in. It’s always fun to find secret stashes of powder. Be wary of following in the tracks of locals into unknown zones. The tracks could go through terrain the locals know well, but might hold hazards for you: cliff bands, creek gullies, tree wells, or tight chutes. The zone may also have a necessary exit point to avoid dropping into a terrain trap. If you want to explore unknown extreme terrain, be sure you have the skills. If you are unsure of what the area contains, consult with ski patrol. In many resorts, you can hire a guide to lead you in and out of the terrain. Clogging the center of a trail, run or junction invites collisions. So does standing in the lift unload zone. To be safe when stopping, choose places that will avoid setting up an accident. When stopping, avoid halting in the middle of runs, trails or junctions. Always pull off to the side. On narrow cat tracks, ski in control enough that you can wait until the trail widens to steer aside. This is especially important when a group of people ski together. Four people in a bunch can cut off access in the middle of a narrow run. When skiing, we focus so much on ourselves: our turns, how we’ll navigate the route and what’s in front of us. We rarely pay attention to what else is around or behind us. You can increase your safety on a slope by paying attention to skiers and snowboarders around you. Be alert. Learn to read those skiing in front of you. 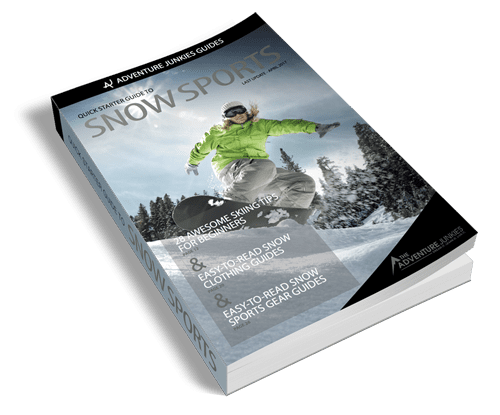 Look for a particular rhythm and range to their turns that can help you identify how to ski around them. But, remember to still steer wide around them in case they alter their course. Get the in the habit of looking uphill. When you stop to rest, look uphill to see what may be coming your direction and stand in a place out of the way. Likewise, before launching into more turns, look uphill to gauge when you can merge in a safe way. 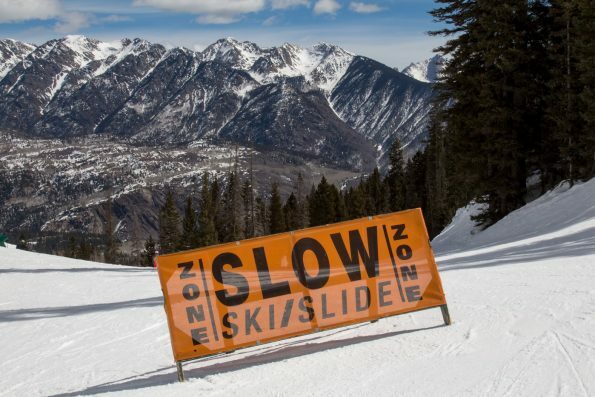 When approaching intersections of runs and blind spots, ease up on the speed to be able to assess oncoming skiers and make adjustments in your route. Often when skiing, we discount the importance of hydration. After all, we are skiing on frozen water getting thirsty seems farfetched. Unfortunately, by the time we get thirsty, we are already suffering from the effects of dehydration. In fact, too many skiers rely on a quick slurp of water at a fountain or a cold beer to shake the effects of dehydration. Keeping hydrated is important for skiing. It aids in retaining energy, supporting muscle performance and enhancing cellular function. Drinking water helps to cope with altitude especially for skiers going to high elevations where the air is more arid. This can prevent headaches and other ill effects from high elevation. To help with hydration on the slopes, drink frequently. Some skiers carry water bladders in packs to rehydrate on the chairlifts. You can also take frequent breaks to drink water, hot tea or energy drinks. Eating fruits and soup can also aid in replenishing lost fluid. Keep in mind that caffeine and alcohol are dehydrators and should not be used as substitutes for water. Closed areas are to keep skiers away from hazards. Ski patrol closes slopes for snow, avalanche, rock, cliffs, creeks or melt-out hazards. Skiing into these areas is risky. 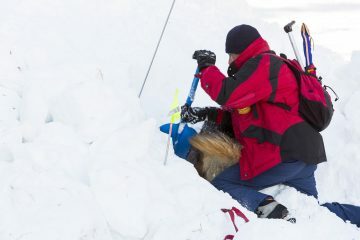 Plus, should something happen, ski patrol then must come into the hazardous area to perform a rescue. Staying out of closed areas ensures you will have a safer day on the slopes. Fresh powder snow lures skiers into the trees for soft deep turns. But in some locations, those trees hold hidden dangers that can be fatal. Ski resorts with evergreen trees, such as hemlocks, spruce and firs, are places skiers should be cautious about. Deep snow creates a well around the base of the tree, which may sometimes be hidden by the tree’s low branches. Some of these wells can be more than six feet deep. These tree wells are filled with loose snow that can trap skiers who fall into them. It may sound innocuous, but skiers often fall in upside down. So why are the tree wells dangerous? Due to the loose snow, skiers can’t get out. This is because snow consolidates around them, similar to what happens in an avalanche. What can you do to protect yourself from falling into a tree well or suffocating when immersed in snow? If you are planning to ski in the trees, take a buddy. Ski near enough to each other that you can see if your buddy falls into a tree well and respond. Avalanches can be deadly. To mitigate the risk, most resorts bomb or ski cut avalanche-prone slopes within the ski area boundaries. However, this does not usually go beyond the boundary or in side country. Only go into avalanche terrain when the hazard is minimal. You can find the potential hazard level by checking the avalanche report. Ski with at least one buddy in an avalanche terrain. Both of you must also carry the appropriate gear—a beacon, probe and shovel—and know how to use them. The gear cannot be shared if one person gets buried. 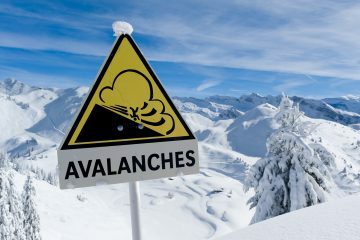 If you haven’t taken an avalanche course nor have the gear, steer clear of all potential avalanche terrains. 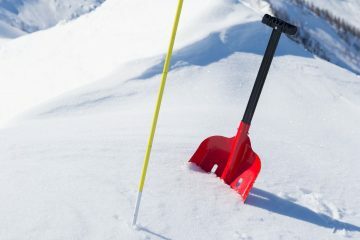 If you plan to ski out of bounds, check in with ski patrol for an update on avalanche conditions or advice on routes. 1. If you are involved in or witness a collision/accident, you must remain at the scene and identify yourself to the Ski Patrol. 2. You must not use lifts or terrain if your ability is impaired through the use of alcohol or drugs. Most ski patrollers concur that accidents happen at the end of the ski day. Why? That’s when fatigue sets in. Add the urge to ski for one more run and the adventure ends with torn ACLs, collisions or even worse injuries. To avoid being hauled off the slope in a ski patrol toboggan, be conscious of your muscle strength and endurance. It’s better to call an end to your day to go celebrate in the bar or hot tub than end up in the hospital. Make safe decisions to ensure that your ski vacation will be a success.